What's the Difference Between a Custom and Timeline Review? 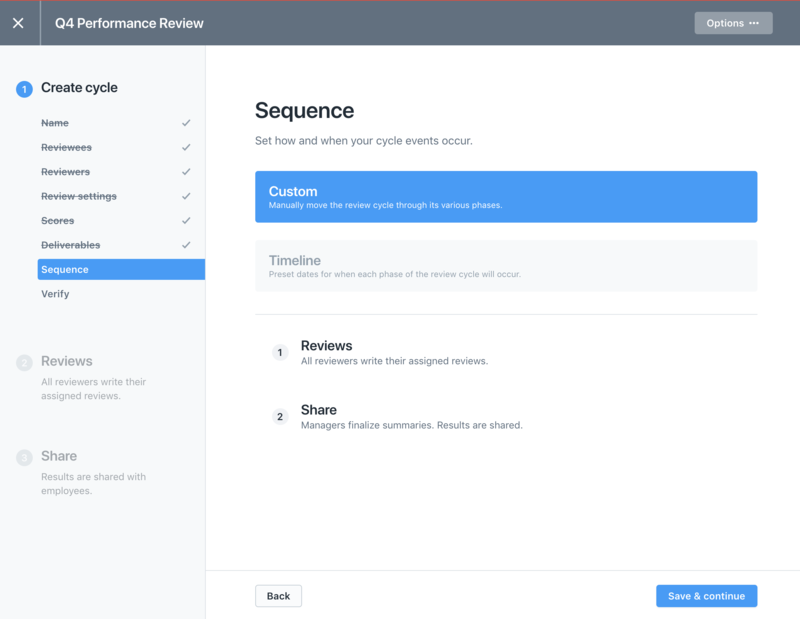 When creating a review cycle, there are two options when it comes to the sequence. 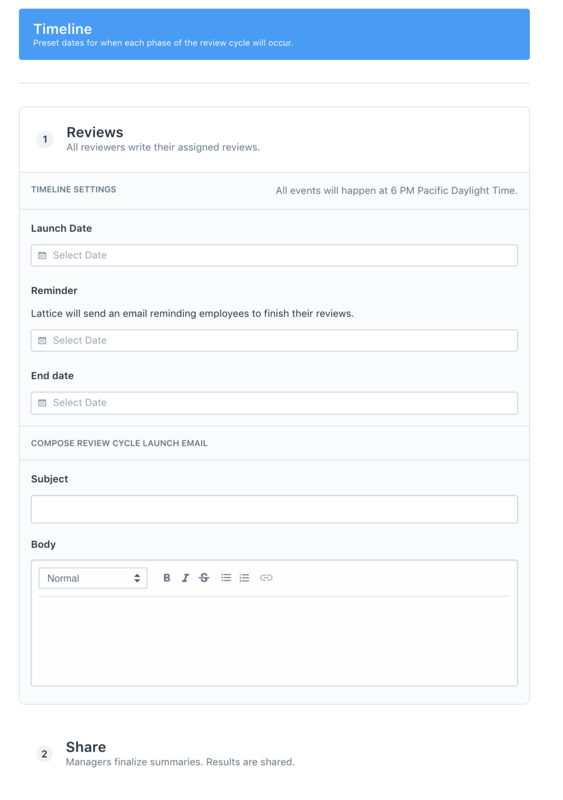 You can create a scheduled review (timeline) or opt for a manual review. A review using a timeline sequence is one where the timing for all emails and reminders are automatically set up ahead of time in Lattice. These follow a strict schedule. 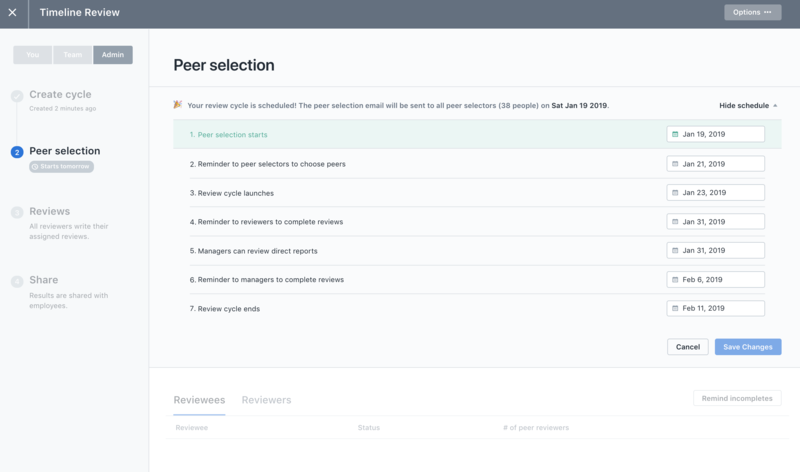 For example, no matter how many people have completed the first stage (peer selection), once the pre-determined date arrives, the peer selection phase will end and the reviews stage will launch. Regardless of how many people have completed the tasks in any stage, a timeline review follows the pre-set schedule. The admin will not have the ability to go in and retroactively move back a step in the review cycle. If an admin finds that the timeline is moving too fast (or too slow), they do have the ability to go in and change the dates in the timeline for the future or take over the review cycle manually. Once a cycle has been taken over manually, however, it cannot be put back on a timeline. A review following a manual sequence is one without a pre-set timeline, and the schedule is controlled by the Admin through out the review cycle (or manager given permission to create the review cycle). For example, with a manual review an Admin (or manager) can wait until they feel the time is right to move the cycle along to the next stage.